We are back! After a long period of transition and moving across the country, we have made our maiden TJ's shopping trip on the east coast, and we're ready for another blog entry. Well, let's face it: mac and cheese was never really health food...and deep fat frying it isn't exactly a step in the right direction...unless, of course, the direction you want to go involves triple bypass surgery. I think my good buddies at TJ's read my blog about their "Joe's Diner Mac n' Cheese" and resolved that their next macaroni and cheese product would NOT be bland. Trader Joe's Mac & Cheese Bites are quite tasty...but these little balls make Philly Cheesesteaks look like Weight Watchers entrees. The bites must be about a half an ounce a piece, yet paradoxically, about 3 ounces of grease flow out of each one. A half a dozen of the things completely drench a paper towel in milliseconds...we're talking crazy, freaky, Stargate portal summoning grease from another dimension type lipids here...the Simpsons episode where Bart rubs the Krusty Burger on the wall and it magically becomes transparent came to mind...Sonia and I have a new window in our apartment thanks to these little bites. But they do taste good. I mean, something with this much grease HAS to taste good...unless, for some strange reason, you don't like grease. If you don't like grease, I suggest you avoid the aisle they sell these things in at TJ's entirely. We did wind up putting some Cholula hot sauce on them just to give them a little more kick, but I was happy with their flavor and the comfort food coma that followed. I give them 4 out of 5 stars. Sonia gives them 3.5, docking some points because she's still mopping up the pools of liquid fat in the kitchen. Just tried these today at the sample station. They ARE delicious. And greasy! We love TJ's, and are always looking for new items to try. Some of our family favorites include the Candy Cane Joe-Joe's, Mandarin Orange Chicken, and Reduced Guilt Pita Chips with Sea Salt. Great blog. Have you considered getting on Twitter? They ARE delicious. I baked mine and not a lot of grease poured out. Not sayin it's not there, but just sayin'. Wouldn't make a daily diet of them but they are good in a pinch. I served these at a halloween party and they were a big hit! Delicious!!! Media, PA!! My home town! 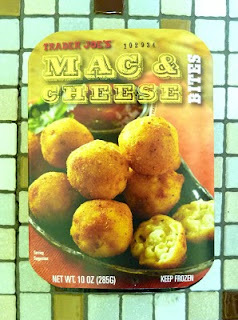 Now my trader Joes is Crystal Cove, Ca :) and I LOVE the Mac n Cheese bites! That's it? That entire blog entry with an update on your personal life for one thing? What ELSE is good at Trader Joes? I was really impressed with the mac n cheese bites. They definitely exceeded my expectations. I put them in the oven. Didn't find them too greasy. Maybe they modified the recipe since 2010. I will buy again. A great snack!